Under the direction of Ministry of AYUSH, Central Council for Research in Homoeopathy(CCRH) has developed a program on Homoeopathy for Healthy Child. The program has 2 components namely, ‘Homoeopathy for teething complaints in children’ and ‘Integration of Homoeopathy with Rashtriya Bal Swasthya Karyakram (RBSK)’. The component on ‘Homoeopathy for teething complaints in children’ focuses on children in the age group of 6 months to 3 years and aims at promotion of healthy teething by using bio-chemic medicines. Teething associated problems such as diarrhea, fever, loss of appetite, irritability etc. 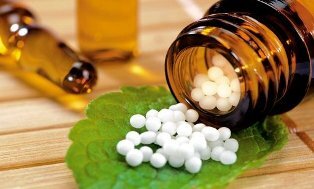 are treated with homeopathic medicines. The component on ‘Integration of Homoeopathy with RBSK’ focuses on children in the age group of 0 to 18 years and aims at screening, early detection and early intervention of defects, delays, deficiencies and diseases identified under RBSK. The Auxiliary Nursing Midwifery (ANM) and Accredited Social Health Activist (ASHA) workers in these blocks have been trained, where in, common problems associated with primary teething were detailed and the use of homoeopathic medicine kits have been detailed. The participants have been provided with the medicine kits and data recording registers and subsequently data are being collected and compiled. Nodal officers have been identified at each centre, who are in regular communication with the ASHAs. The Anganwadi workers in the blocks have been sensitized of the teething related problems in children and have been requested to refer such cases to the local PHC or to the ANM/ASHA in case of children developing teething related complaints. The homoeopathy doctors in the identified districts have also been sensitized about the program being conducted and how ANM & ASHA have been trained on the use of medicine kits. They have been requested to coordinate with the ANM & ASHAs in the respective PHCs so that children suffering from dentition related complaints or other complaints can be referred to the homoeopathy doctors as and when required. All these programs were conducted in coordination with the district and block level authorities. Experts from homoeopathy, pediatrics and dentistry or community medicine were the resource persons in these programs. More than 40,000 children have been enrolled whose records are being maintained by the ASHAs. Children with minor episodes of diarrhea have been given homoeopathic medicines in consultation with the homoeopathic physicians. No adverse effects of the medicines have been reported so far. The nodal officers of the program have been trained on undertaking screening of children for 4 Ds (defects, developmental delays, deficiencies and diseases) as outlined under the RBSK. The development of block level micro plans for implementation of activities on Integration of homoeopathy with RBSK is in progress. ‘Child Friendly Clinics’ are being established at identified centres.